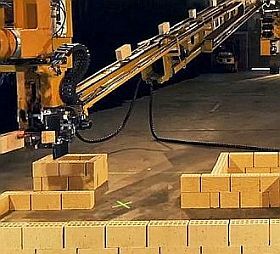 Australia’s one-armed robot bricklayer has just built its first house in under three days, a milestone described by its Perth-based creator as a "world first". Robotic technology company FBR Ltd says the Hadrian X, the commercial version of its robot, built a 180-square metre, three-bedroom, two-bathroom home in less than the targeted three days. "What we have achieved here is a quantum leap for the construction industry," chief executive Mike Pivac said. "We are excited by the performance and results, given this work was completed in test speed and for the very first time." The feat was accomplished after completing Factory Acceptance Testing of the Hadrian X construction robot. A structural engineering consultancy group verified the structure met relevant building standards. "We are all justifiably proud and excited to have achieved this world first milestone for FBR," Pivac said. "We now have the world’s only fully automated, end-to-end bricklaying solution, with a massive market waiting for it. "We will now take everything we’ve learnt to date in the Hadrian X program and make some refinements ahead of bringing both Hadrian X robots back to our High Wycombe facility for demonstration to key commercial stakeholders. The Hadrian X requires minimal human interaction and works day and night, laying up to 1000 bricks an hour, about the output of two human bricklayers for a day.